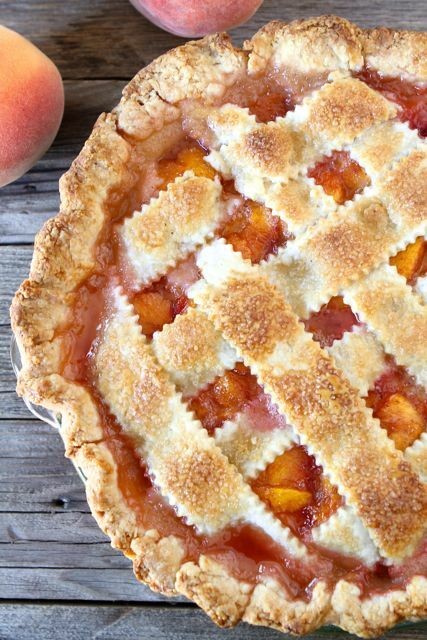 Peach Pie – Learn how to make a peach pie from start to finish! 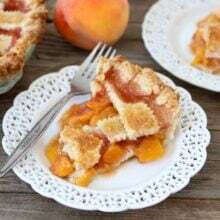 From the beautiful lattice pie crust to the peach pie filling with cinnamon, nutmeg, and vanilla, this is one perfect peach pie! I don’t bake pies, I bake cookies. Ok, I’ve baked a few pies in my lifetime, but I am really not skilled in the pie area. Baking a perfect pie crust is on my bucket list, so I invited my friend, Annalise, over. She is the pie professional. She knows pies, and she agreed to show me how to make a perfect pie crust and bake up a beautiful pie. Lucky me! Annalise taught me how to make a perfect pie, from start to finish. It really isn’t hard at all. The secret ingredient in this pie crust is buttermilk. It makes the pie super flaky and delicious. You also need to make sure your butter is super cold and don’t over work the pie crust. You want to see little chunks of butter and you want the pie crust to be flaky! Over working the dough will result in a big mess. Slowly add water if the pie dough is too dry, a little goes a long way so add little by little. Chill the dough for at least an hour before rolling it out. You can make the pie dough days in advance or keep it in the freezer. This pie crust recipe makes enough for two pies or one pie that has two crusts, like this one. 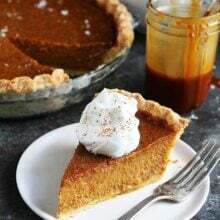 The pie crust recipe is below, but if you want detailed step-by-step instructions on how to make a perfect pie crust, visit Annalise’s blog for a great pie tutorial. The most important part of this pie, besides the perfect pie crust, the PEACHES! Use ripe, fresh peaches for best results. 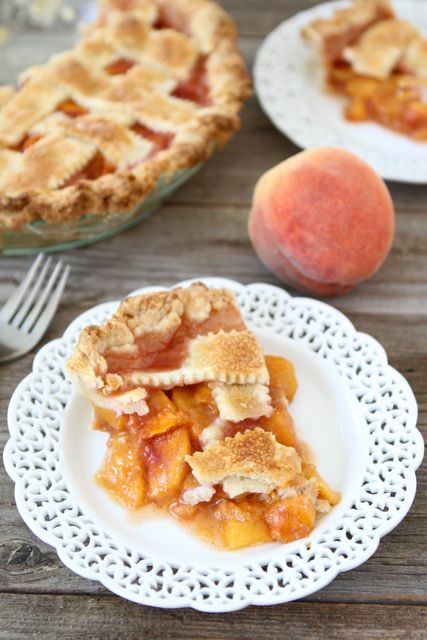 I love making this pie in the summertime when peaches are at their peak! For the peach pie filling, I added cinnamon, a hint of nutmeg, and a splash of vanilla extract. The flavors complimented the peaches nicely. We did a lattice topping on the pie, but you could cover the top with pie dough to make a double crusted pie. Both ways are delicious! And if you aren’t a skilled pie maker, that is ok, the rustic look is in! I promise it will still taste good. I was very pleased when I pulled my peach pie out of the oven. Look at that gorgeous lattice top! Amazing! I didn’t want to cut into my peach pie because it was so pretty…but when Josh came home, I knew my masterpiece wouldn’t stand a chance. He wanted a piece of peach pie for dessert! And I’m not going to lie, I was also anxious to have a taste of the finished peach pie filling. My peach pie was perfect and so good with a scoop of vanilla ice cream or a dollop of whipped cream. 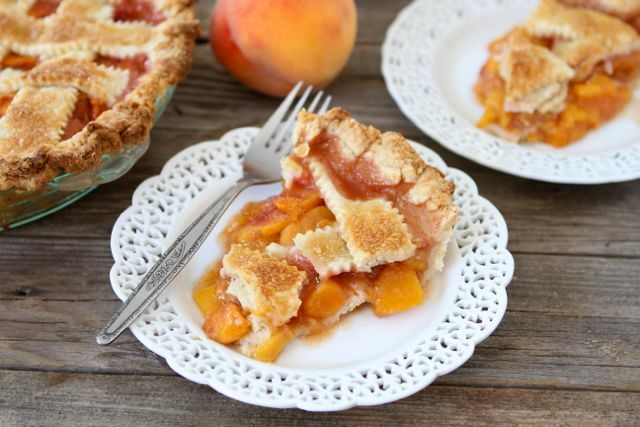 Now, it is your turn-go bake a peach pie! Happy pie baking! You can't beat a slice of homemade peach pie. Go all out and add a scoop of vanilla ice cream-dessert perfection! Combine the flour, sugar, and salt in a bowl. Add the cubed butter and toss to coat. Dump the mixture out onto a clean surface and use a rolling pin to roll the butter into thin sheets, combining it with the flour. Use a bench scraper to scrape the rolling pin and to bring the mixture back into a pile as necessary. Continue until all of the butter is incorporated into the flour. Mixture will be very flaky. Return mixture to the bowl and place in the freezer for 15 minutes to chill the butter. Remove from freezer and add the buttermilk. Use a spoon and then your hands to stir the mixture until it comes together into a ball. If mixture is too dry, add the water a tablespoon at a time. Divide the dough in two and flatten into disks. Wrap each disk in plastic wrap and chill in the fridge for at least 1 hour and up to 3 days. While the dough is chilling, make the peach pie filling. In a large bowl, combine peaches, sugar, cinnamon, nutmeg, cornstarch, and vanilla extract. Gently stir until mixed well. When ready to roll out, let the dough rest at room temperature for five minutes. On a lightly floured surface, use a rolling pin to roll out the dough into a rough 13 inch circle. Dough should be about 1/4 inch thick. Transfer dough to pie dish. Fill pie with peach filling. Repeat with the second disk of dough. Cut dough and make a lattice over the filling. You can also leave the circle intact and cover the filling completely, cutting a few vents with a sharp knife, but I went with a lattice top for my peach pie. Fold the edges of the top and bottom crusts together and use your index fingers and thumb to pinch into a pattern. Brush with egg wash and sprinkle with turbinado sugar. Bake in a 400 degrees F oven for 45 minutes or until the pie is bubbling and the crust is golden brown. Let the pie cool completely on a wire cooling rack before cutting. Note-you can use this same pie crust to make apple pie, berry pie, strawberry rhubarb pie, etc. Use your favorite filling! Maria this pie is beautiful!! For someone who says she doesn’t bake pies, you could have fooled me! It’s perfect! We all need an Annalise in our lives I think! Irresistible and so prettily decorated! What a gorgeous tart! Mouthwatering! This pie is a beauty! Love it! I think your peach pie looks wonderful…..! What a beautiful peach pie, Maria! As a pie crust-impaired baker, looking forward to trying your recipe – thank you! Peach pie perfection! You did a rockin job! Now I have to get over my fear! What a yummy pie!! If my pies looked like this I’d skip the cookies and bake the pie!! I love the idea of buttermilk in the pie crust — can’t wait to try this! Oh my gosh, this pie looks AMAZING! I love pie, hate making it, the dough is always so stressing, even though it is easy if you don’t over think it. Well for someone who doesn’t bake pies, this looks absoutely stunning, good job!!! What a gorgeous peach pie, Maria!!! Love it! Yes, I admit it openly: I will probably cheat and get the ready made crust. This pie looks so yummy. oh what a perfect pie Maria! I’ve never made a top crust like that – I think I need to for Love the Pie party this year!! This looks gorgeous! And oh so yummy! That is a beautiful pie. And I LOVE your plates!! My favorite pie in the whole wide world. Especially when it’s made by Mom. 🙂 Yours is a beauty. Homemade pie crust is also on my “to conquer” list for next year. I can’t wait to give this a try! That pie looks superb! The lattice work looks beautiful! 🙂 Thanks for sharing! Now that’s a pretty pie. Annalise is the queen, I’m going to have to get a lesson now too! gorgeous!!! i am so so impressed! Love peach pie, but I just bought tons of concord grapes…. 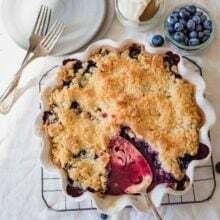 Ever have a concord grape pie? Mmmmmmmmmmm! Never added buttermilk to a pie crust. Sounds great. LOOOOOOOve the peachy pie Maria! Oh Maria I just love this pie! I never got around to making one this summer, but yours looks just perfect. This is a gorgeous pie! So perfect! I’m with you, cookies are more fun to bake than pies! I have a hard time making pies look beautiful, but yours looks gorgeous! How do I get Annalise at my house? You did a great job. The pie is beautiful. Now you’ve done it, (baked a pie) and it is perfect, so I am hoping to see more pies! This looks absolutely beautiful. I love pies more for the appearance than the taste. It looks amazing! Your pie looks gorgeous! I’ve never heard of using buttermilk in a crust; I am definitely going to try it next time! I’m a sucker for pie, this looks delicious! You are making me want a slice now! This is just gorgeous! Peach pie is one of my faves! It really is so pretty! too good Maria! Have a great weekend! Oh that’s gorgeous! Now I want to make a peach pie. They’re so delicious! This looks so good I could just die!! Plus, the crust looks perfect…perfect delivery into my mouth for a perfect morsel of peachy goodness. Yes please. I just realized that I didn’t bake pies for a very long time. I’m so lazy with the crust, I have a recipe that works, but there is something with it that doesn’t move me to work with it. But when the pie is in the oven I thanks myself to be strong and bake it. Of course never made it with peaches, but just looking at your pictures makes me run to marked and buy some. What a good looking pie! Saw this photo on FoodGAwker and clicked over to your site. Beautiful photography! I could eat that off the screen, Maria! Looks yummy!! This pie is the perfect way to say goodbye to summer! Yum! This reminds me of my mom. Growing up she always made us peach pie and apple pie this time of year. I can’t believe I went through summer without having pie! Not okay. I think that needs to change, especially after starring at this for the past 5 minutes. Beautiful! Can you freeze the pie crusts for future use? Or do you think there would be a problem because it uses buttermilk? Yes, you can freeze the pie crust. I have one in the freezer right now! What size is your pie plate? Made this pie, and it was delicious. I substituted heavy cream for buttermilk because that’s what I had in my fridge. Each day as the pie sat, it got tastier and tastier. Already making my second one for guests this weekend. 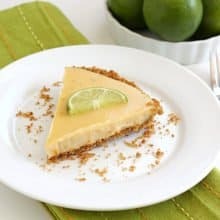 I have tried several different pie crust recipes looking for that “perfect” crust. I loved this recipe for two reasons: 1) the buttermilk, and 2) the technique for incorporating the butter. I visited Annalise’s sight for the tutorial and it was very helpful. I also used a lattice top for my peach pie, and it turned out gorgeous! In appearance, this pie was my best. When I cut into it, I was a bit disappointed. It was more runny than I was hoping. I used only 3 tbsp on cornstarch because I didn’t think my peaches were very juicy. Also, the bottom crust was doughy in the middle. Any suggestions for preventing this problem? I love pie. I love making it, especially now that 8 found a great recipe for a beautiful flaky crust. We’re approaching apple season here in Illinois, and I want to make apple pies, but I don’t want a doughy, soggy bottom crust. Thanks for your help! can you do the pie crust without buttermilk? I haven’t tried this recipe without the buttermilk. Gorgeous! Where did you get those plates?! Thanks for the inspiration! I got them at Pier 1 a few years ago! Thanks! I love pies!! I’m pie crust impaired and avoid pies whenever possible :/ I’m impatient by nature…not at all proud of this I might add! So in my true form I tried this crust…but chose to not refrigerate the crust before rolling out and filling as instructed. I simply mixed all of the crust ingredients together. I don’t condone this behavior of mine, but….well my impatience surprises me at times…and produced a spectacular pie just the same! Delicious and just peachy on this 4th of July! Have you ever made this pie filling and canned/froze it? Do you think it would work? What a delicious pie! I could probably eat that whole thing easily. This is not only beautiful, but it looks delicious! Thanks for sharing. I can’t wait to try that flaky buttermilk crust. Hello. I know this recipe was posted several years ago but I had a question. 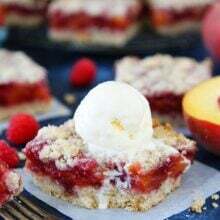 I am assuming you used a 10 inch pie plate and if the peaches are not as sweet as I like which sometimes happens in Indiana, could I use more sugar and if I did would you add more cornstarch also. Thank you. All though the pie was good; I thought the nutmeg and cinnamon made it to much like a apple pie. I think the spices over powered the peach .